simple retrieving. However, also efficient is a particular sharp agitation by twitching. Within weedy area a slow retrieve between the weeds is recomended for good results. 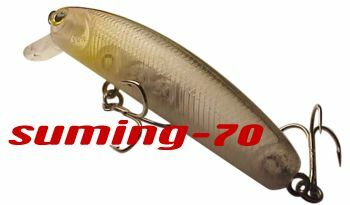 The Carolina rig is another way to enjoy the Suming-70. bass professionals and amateurs as tournement participants also use Suming in Japan.